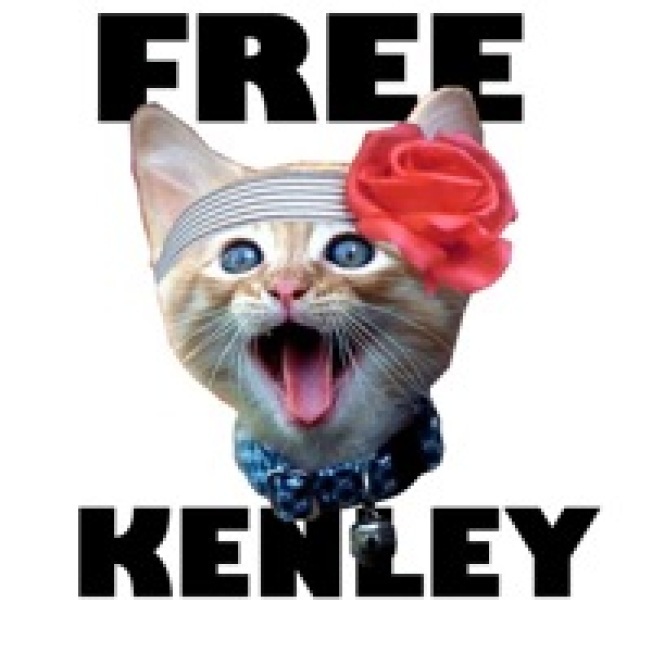 Cries from the Tulle-Box: Free Kenley Collins! I've never been one to follow fads. Okay, never mind. But throughout the shitshow that presented itself as the fifth cycle of Project Runway, where some jerk from my hometown decided to wear ill-fitting black denim and sling homophobic asides underscored with envy to the camera, I also had something of a soft-spot for finalist Kenley Collins. From her contrived Bettie Page bangs to her gratuitous floral hair accents to her vicious sneer, dear Kenley was what ultimately proved to be the fifth season's raison d'etre -- in a season with no fan favorites, brimming with bitchy villains, Kenley was by far the bitchiest. And now that she’s sitting in a dank cell for egregious misuse of a feline, no doubt carving a shank out of a toothbrush. So it’s with some modicum of pride that I take up this extremely important cause, like Naderites at the DNC, and count down the days until Kenley, like Martha Stewart or Lil’ Kim before her, emerges victorious, free to sew the entire universe up in tulle, tulle, tulle! It’s not like I was planning on leading the proletariats against AIG, anyway. Meanwhile, feel that violent gust of wind that seems to portend a natural disaster the size of Hurricane Katrina? It’s just sneaky heffalump Harvey Weinstein sighing in relief, because Collins’ comical cat-astrophe may prove to be the life support desperately needed by season six of the fashion competition if it hopes to emerge from TV limbo, resplendent in its pre-lawsuit glory. The upside to this episode: At least marriage now appears out of the question for the tugboat captain’s daughter, which also prevents her from adopting boyfriend Zak Penley’s last name and thereby becoming Kenley Penley.